Distributed, networked communication systems, such as relay beamforming networks are typically designed without considering how the positions of the respective nodes might affect the quality of the communication. That is, network nodes are either assumed to be stationary in space, or, if some of them are moving while communicating, their trajectories are assumed to be independent of the respective communication task. However, in most cases, the Channel State Information (CSI) observed by each network node, per channel use is both spatially and temporally correlated. One could then ask whether the performance of the communication system could be improved by predictively controlling the positions of the network nodes (e.g., the relays), based on causal CSI estimates and by exploiting the spatiotemporal dependencies of the communication medium. In this talk, we address the problem of enhancing Quality-of-Service (QoS) in power constrained, mobile relay beamforming networks, by optimally exploiting relay mobility. We consider a time slotted system, where the relays update their positions before the beginning of each time slot. Adopting a spatiotemporal stochastic field model of the wireless channel, we propose a novel 2-stage stochastic programming formulation for specifying the relay positions at each time slot, such that the QoS of the network is maximized on average, based on causal CSI and under a total relay transmit power budget. The motion control problem considered is shown to be approximately equivalent to a set of simple subproblems, which can be solved in a distributed fashion, one at each relay. Numerical simulations are presented, corroborating the efficacy of the proposed approach and confirming its properties. 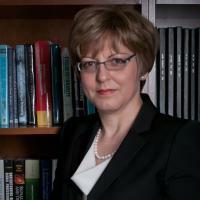 Dr. Athina P. Petropulu is Distinguished Professor of the Electrical and Computer Engineering (ECE) Department at Rutgers, having served as chair of the department during 2010-2016. Before that she was faculty at Drexel University. She held Visiting Scholar appointments at SUPELEC, Universite’ Paris Sud, Princeton University, and University of Southern California. Her research interests span the area of statistical signal processing, wireless communications, signal processing in networking, physical layer security, and radar signal processing. Her research has been funded by various government industry sponsors including the National Science Foundation, the Office of Naval research, the US Army, the National Institute of Health, the Whitaker Foundation, Lockheed Martin. Dr. A. Petropulu is Fellow of IEEE and recipient of the 1995 Presidential Faculty Fellow Award given by NSF and the White House. She has served as Editor-in-Chief of the IEEE Transactions on Signal Processing (2009-2011), IEEE Signal Processing Society Vice President-Conferences (2006-2008), and member-at-large of the IEEE Signal Processing Board of Governors. She was the General Chair of the 2005 International Conference on Acoustics Speech and Signal Processing (ICASSP), and the general co-chair of the 2018 IEEE workshop on Signal Processing advances in Wireless Communications (SPAWC). In 2005 she received the IEEE Signal Processing Magazine Best Paper Award, and in 2012 the IEEE Signal Processing Society Meritorious Service Award for “exemplary service in technical leadership capacities”. She is IEEE Distinguished Lecturer for the Signal Processing Society for 2017-2018.